The new year marked the beginning of two new Johns Hopkins academic divisions: the Carey Business School and the School of Education. The university trustees announced the decision in early December in response to a $50 million gift given by trustee emeritus William Polk Carey. The new schools will build upon the programs already established by the School of Professional Studies in Business and Education (SPSBE). William Polk Carey gave $50 million to create a new business school at Hopkins. "More than a century ago, Johns Hopkins University forever broke the mold in American medical and graduate education," President William R. Brody said in the announcement. "Bill Carey's generosity makes it possible for Johns Hopkins to break the mold again, this time in the education of our nation's leaders in finance, industry, and entrepreneurship." The gift, donated through the W. P. Carey Foundation, was given specifically to found the business school, and will be matched by another $50 million from other donors. Carey is chairman of W. P. Carey & Co. LLC, a New York real estate investment firm. The Hopkins school is named for his great-great-great-grandfather, James Carey of Loudon, who was an 18th- and 19th-century Baltimore shipper and a relative of Johns Hopkins. "Johns Hopkins, one of the leading universities in the world, has played an important role in the history of my family," Carey said in a statement. "I am pleased that 130 years after its founding by my cousin Johns Hopkins, I am able to add to his legacy by enhancing the university's contributions of knowledge to the world." SPSBE has gone through a number of name changes over the years — including the School of Continuing Studies and the Evening College — and has in its history been home to part-time programs in many disciplines. Over the past 20 years, however, all but the business and education programs transferred to their respective schools. According to Pamela Cranston, vice provost for academic affairs and the Carey Business School's interim dean, in the last five years, it became clear that for those two programs to really thrive, change was necessary. "For them to continue to improve and enhance their programs and to grow in stature and in impact, they needed their own identities," Cranston says. "I have this image of the doves coming out of the cages and being able to soar. The energies can be released." The Carey Business School aims to set itself apart from other schools by producing leaders who have both strong business skills and knowledge from other top-ranked Hopkins programs. Hopkins already offers joint programs in biotechnology, nursing, and public health. The new school will strengthen and expand those programs. "It will be a full-fledged business school," Cranston says. "What we'd really like to do," she continues, "is bring in a dean who understands the current business world and understands the current world of business education, and says, 'How can we do it better? How can we really be a leader and distinguish ourselves from other leading business schools, while still aspiring to be one of the national if not international leaders in business education?'" Ralph Fessler had been dean of SPSBE since 2000 and is now dean of the School of Education. He says the creation of a separate school affords a good opportunity to build on the program's existing efforts to address problems facing public education. "We're fortunate that we're not starting at the beginning," he says. 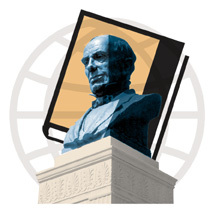 "We're building on almost a hundred-year history of education at Johns Hopkins." The program awards more than 500 master's degrees in education per year, and will continue in its efforts to recruit and train teachers and principals, especially for challenged urban schools; help children who are placed at risk for failure, like those from low socioeconomic backgrounds; and develop research-based curricula focused on school improvement. "Attracting and retaining the best." That's the answer Michael Eicher, vice president of development and alumni relations, gives when asked, What will all that money be used for? Gilman Hall: one item on the campaign's to-do list. Last fall, Johns Hopkins raised the goal of its Knowledge for the World campaign to $3.2 billion and extended the campaign until 2008. (The original goal of $2 billion was surpassed in December 2005.) Specifically, says Eicher, some of the priorities for the additional money are to provide undergraduate and graduate financial aid; to support the Baltimore Scholars Program, which provides full undergraduate tuition to city public school students; to support research of junior and senior faculty; and to fund a number of teaching and research building projects, including new facilities for the School of Nursing and the Berman Institute of Bioethics, an addition to the Eisenhower Library, and renovations to Gilman Hall. "It's really important that we do that, and do it right," Eicher says about the Gilman project. "We've talked about that for 20 years." 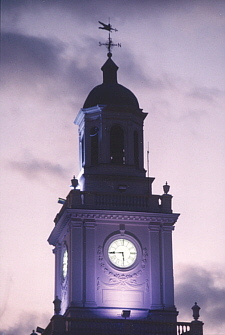 At an October dinner announcing the expansion, President William R. Brody noted, "It's a different world from the one in which we launched this campaign. Transformations in society have created new problems for the planet. At the same time, dramatic new developments in the sciences, technology, the humanities, and the arts provide new opportunities for enhancing the quality of human life." To be sure, the campaign has been a success so far. As of December 31, 2006, the university had raised $2.44 billion, including the $50 million gift from William Polk Carey (story opposite page) and a $20 million gift from university trustee David Koch to fund the David H. Koch Cancer Research Building. Steven Knapp has spent 12 years at Johns Hopkins, first as dean of the Krieger School of Arts and Sciences, then as the provost and senior vice president for academic affairs. In that time, he has become what university President William R. Brody calls an "invaluable, indeed, essential partner in every important initiative undertaken in my 10 years at Johns Hopkins." Steven Knapp departs Johns Hopkins after 12 years: "That collaborative spirit is something I want to take with me." Photo by Shiv Gandhi On December 5, the Hopkins community learned that Knapp had accepted a position as president of George Washington University. It is the fourth time in two years that a senior leader at Hopkins has departed Hopkins for the presidency of another college or university. "My happiness at gaining such an exceptional new presidential colleague is, of course, tempered by my regret at Steve's departure from Johns Hopkins," Brody wrote in an announcement to faculty and staff. "We shall all be the poorer for his absence." During his decade as chief academic officer, Knapp oversaw the work of the university's eight schools, encouraging collaboration among them, and helping to appoint all but one of the deans. He has had a special interest in the university's role in the community and with issues of diversity, helping to create the Office of Equal Opportunity and Affirmative Action Programs, the Diversity Leadership Council, and the University Committee on the Status of Women. He also played an integral part in establishing the Committee on Undergraduate Education, aimed at improving the undergraduate student experience. 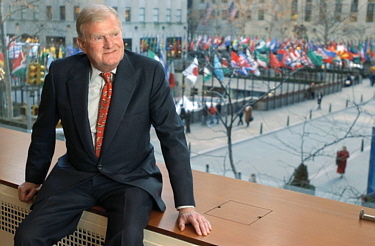 Knapp has been actively involved in fundraising, including for the Knowledge for the World campaign, and he was instrumental in securing a $50 million donation that will establish the new Carey Business School. He has been involved in finding new sources of student aid and support for faculty, and recently lobbied to fight cuts to the Joseph A. Sellinger State Aid Program, which provides Maryland's private colleges and universities with unrestricted funds. Knapp says he will miss Hopkins for its people, its collaborative environment, and its academic excellence. "There's nothing like Hopkins," Knapp says. "The culture of inquiry, the dedication of the faculty to their work in their fields, its international breadth, and its growth and vitality are just remarkable." Knapp, a specialist in 18th- and 19th-century English literature and in literary theory, came to Hopkins after 16 years at the University of California, Berkeley, where he was a faculty member of one of the nation's leading departments of English. A 1973 graduate of Yale University, he earned his doctorate from Cornell University in 1981 after receiving a master's degree there in 1977. At Hopkins, Knapp has been appreciated by his colleagues for his intelligence, sense of humor, and calm in times of crisis. "Steve can see the irony in any tense situation and zeroes in on the foibles of people with a wonderful, and sometimes zany, humor," Paula Burger, the Homewood campus's dean of undergraduate education, told The Gazette. Knapp and his wife, Diane, own a sheep farm in northern Baltimore County, which they plan to keep when they move into the president's house at George Washington. Knapp will take office on August 1; he will be succeeding Stephen J. Trachtenberg, who has been president since 1988 and will retire. Knapp says he was drawn to the position in part because of the university's growth in size and stature. "George Washington is poised to move into the first tier of American research universities," he says. "I think what's exciting is that this is a place where someone can — working with faculty, staff, and students — really make a difference in the institution over time." Among his initial goals in his new post are bringing in more resources to the university through a large-scale fundraising campaign, and coordinating efforts to reach out to alumni of the Washington, D.C. school, which has 20,000 students. 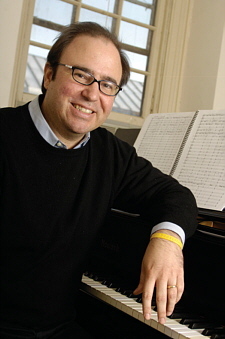 Christopher Theofanidis Christopher Theofanidis has already won more than a dozen significant awards for his classical music. Now the Peabody faculty member may be in line for another: His work The Here and Now has been nominated for a Grammy Award as best contemporary classical com-position. Theofanidis composed his 35-minute piece for the Atlanta Symphony Orchestra, which recorded it on the Telarc label. It is based on poetry by the 13th-century Persian philo-sopher Rumi and was composed for orchestra, chorus, and soprano, tenor, and baritone soloists. In 13 short movements, the piece touches on love, desire, and spirituality. The online publication Classics Today said of it, "Theofanidis' musical settings range from meditative to ecstatic, with much colorful orchestral writing that in tone and timbre often resembles Samuel Barber." Legal counsel for the U.S. Army Corps of Engineers appeared nervous, but perhaps he had just cause. On the witness stand was a representative of Pittman Construction, a contractor hired by the Corps in the 1990s, who had just testified that Pittman had revealed weaknesses in the levee system of New Orleans years before Hurricane Katrina devastated the city in 2005. The Corps' lawyer, perhaps looking for a way to discredit a damaging witness, noted that Pittman had once lobbied for construction of 60,000 houses in a flood plain. The witness replied that Pittman had gone out of business in 1998, so what, exactly, was counsel's point? The attorney for the Corps was silent for a few awkward moments, then opted for a new line of questioning. Pretending to be a lawyer was harder than it looked. Especially when you were a first-year engineering student and you'd had only a few weeks to prepare. The mock trial was part of Ilene Busch-Vishniac's course Freshman Experiences in Mechanical Engineering. The Whiting School of Engineering professor says, "I want students of engineering to see as early as possible that engineering is not done in a vacuum. It has social, ethical, legal, and political repercussions. Second, I find the mock trial is a great way to get students engaged and involved in engineering topics." 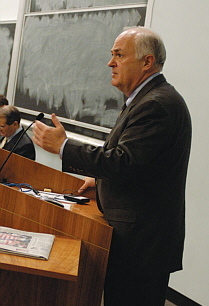 Busch-Vishniac's predecessor teaching the course, Professor William Sharpe Jr., began staging the mock trials some years ago. Each year there is a different case; the previous year, students had argued about engineering issues in the destruction of the World Trade Center. 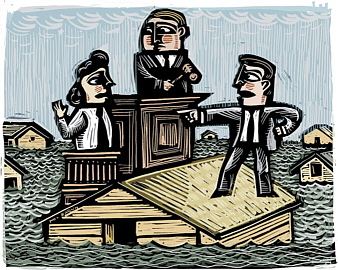 This time, the trial pitted New Orleans home and business owners against the Corps of Engineers and the Orleans Parish Levee Board, with the property owners arguing that the defendants' negligence had contributed to the massive flooding when Katrina slammed into the city. The legal teams and witnesses were all students from Busch-Vishniac's class. James Casey, a juvenile-causes master in the Baltimore City Circuit Court, presided over a three-member jury drawn from the department. The students prepared by scanning news coverage of the disaster and reviewing various government, financial, and engineering reports, as well as legal documents. At the trial, they delivered opening statements, ques-tioned and cross-examined witnesses, delivered summations, then awaited the verdict. They had reports, data, press accounts, and visual aids, if not much courtroom experience. For witnesses, students portrayed some actual figures from the Katrina debacle, including Al Naomi, project manager for the Corps. Naomi was played by a young woman who donned a white shirt and a man's necktie for verisimilitude. Attorneys for the plaintiffs opened the proceedings. Joshua Skolnick, portraying counsel for the homeowners, charged that those responsible for the levees had the resources and warning time to prepare for a storm like Katrina, but had failed in their responsibility. Adam Sierakowsky, representing business owners, charged inadequate design and maintenance of the levee system. The defendants responded first with apologies for all that the plaintiffs had suffered. Then they argued that New Orleans had been built in a bad place that left it vulnerable to major storms, that Katrina had been not just major but an extraordinarily huge storm, and that all concerned had done the best they could with the resources available. We're sorry, they said. But we're not liable. The students wrestled a bit with courtroom procedures, how to cross-examine in a way that didn't hurt their own cases, and how to pronounce "Ponchartrain." Says Skolnick, "The most difficult part of the entire project was making it come together. It was not hard to find evidence. Converting what we had researched into what we presented, and making that intelligent and relevant, was the hardest part." After about 90 minutes, the jury deliberated and returned its verdict: The Corps and the Levee Board indeed had an obligation to protect the citizens of New Orleans, and they had failed to fulfill that obligation. But that negligence had not been the cause of the flooding, so there would be no damages awarded to the plaintiffs. The man accused of killing Johns Hopkins senior Linda Trinh in January 2005 won't be going on trial. On November 14, 2006, the day before his case was scheduled to go to court, Donta Maurice Allen pleaded guilty to the charge of first-degree murder. Allen, 28, admitted that he killed Trinh, a popular biomedical engineering major, during a botched burglary attempt in her Charles Street apartment. He told police that he had stolen from the apartment once before and did not expect Trinh to be home. When he found her at home, the two fought and she tried to call the police. He beat and choked her. Police described Allen as a "close friend" of one of Trinh's sorority sisters. He was arrested two months after Trinh was found dead, and was later charged with first-degree murder. Police had DNA evidence that linked Allen to the crime. With his plea, Allen secured a life in prison with the possibility of parole, though the governor would have to agree to his release. He was sentenced in January. Back in 1985, the deans of the Homewood Schools commissioned an ad hoc group to study the status of women at Johns Hopkins. That committee reported the climate at the university was "at best indifferent and at worst hostile to the concerns of women." Seventeen years later, Provost Steven Knapp convened the University Committee on the Status of Women, which released its own report, Vision 2020, containing the sobering news that not much has changed. According to Vision 2020, Hopkins ranks last among its peer group in percentage of female executives and leaders, and it has substantive, systemic obstacles based on gender in every division of the university. States the report, "Long-standing traditions and attitudes in the culture at the Johns Hopkins University have spawned pernicious effects on career success and satisfaction, and smothered optimism about the future among many women faculty and staff members, as well as among women students." 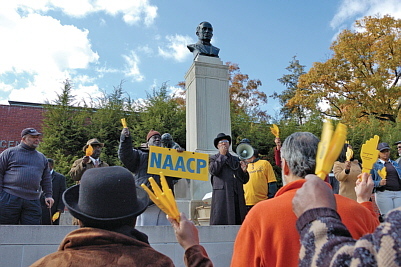 African-American students voice frustrations at a November NAACP rally on campus. Vision 2020 recommends that by 2020 Hopkins achieve complete gender equity in senior faculty and leadership positions. It also identified three themes-leadership, work/life balance, and cultural dimensions-that must be addressed to resolve career obstacles for Hopkins' female employees. "We have the opportunity at this moment in time, this moment in history, to create the first university with true equity for women," committee chair Linda Fried said at the report's release in early November. "We think that this plan offers a plan to accomplish that and have Johns Hopkins become a model for gender equity practices." Gender equity was not the only campus climate concern as 2006 came to a close. Also in November, President William R. Brody announced initiatives designed to encourage greater diversity and tolerance. These include adoption of principles for equity and civility proposed by the University Committee on the Status of Women; implementation of a recommendation from African-American professors that Hopkins develop courses, workshops, and seminars to increase students' exposure to the history and current reality of racism; implementation of a proposal by the university's Diversity Leadership Council to enhance training and education on diversity issues for students, faculty, and staff; and establishment of better and more regular communication between university administration and leaders of Hopkins' multicultural student groups. The announcement of these initiatives came after an October 28 party, hosted by the fraternity Sigma Chi, sparked campus protests. An online invitation to the party contained racial stereotypes, and the fraternity house was decorated with the skeleton of a pirate that, to some African-American students who attended the party, resembled a lynching. Members of Hopkins' Black Student Union organized the protests and a number of campus-wide forums to discuss campus racism. At a campus rally sponsored by the Baltimore chapter of the NAACP in the days following the party, Marvin Cheatham, president of the chapter, called on the university to recruit more black students and faculty. The Hopkins Student Conduct Board found the Sigma Chi chapter guilty of breaking university rules and placed it on social probation until January 2008. The fraternity is barred from hosting parties and holding other social activities during the probationary period. Because of federal privacy laws, Hopkins could not disclose disciplinary proceedings against the student who posted the invitation. In the United States, the first organized game of ice hockey — that is, not just some guys skating around a pond, but a match with designated teams, uniforms, and rules — took place on February 1, 1896, in Baltimore. That's the first little-known fact. Here's the second: The two teams were from Yale and Johns Hopkins. The Hopkins team was led by an astronomy graduate student, Samuel Alfred Mitchell. The match ended in a 2-2 tie, and according to a recent story by Matt Eisen in the Yale Daily News, was played with a rubber ball instead of a puck. 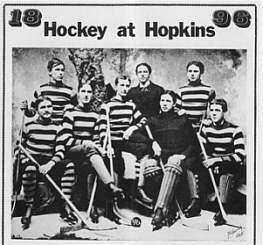 Hopkins' 1896 ice hockey team tied Yale in the first- ever organized match. The 2006 team was not so lucky. Hopkins' team lasted two more years, then disbanded for transportation problems, lack of fan interest, and unspecified but apparently irreconcilable differences with the management of their home ice rink. Ice hockey is now a club sport at Hopkins, and last November the team traveled to Connecticut, where it met Yale's club team in a rematch of that 1896 contest. The Jays fell behind after one period, 2-0, and trailed 4-0 after two. In the final period, Peter Livadas and team captain Jeff Warren, both seniors, scored for Hopkins and the game ended in a 5-2 victory for Yale. "The game didn't quite go as we planned," Warren says. "We had played a game at 10 p.m. the night before against Catholic University in D.C., and it was taxing to drive six hours to New Haven the next morning." The game took place at Ingalls Rink, an old wooden arena known as the "Yale Whale" because of its shape. "It was a great experience for our guys," says Hopkins head coach Jeremy Sarnovsky. Next year, the Bulldogs will come to Baltimore for the second of what the clubs hope will become an annual match. Shortly after the Big Bang, the newly created universe contained an abundance of exotic matter, ephemeral subatomic particles that are very hard to find now. Physicists look for them by whirling protons and antiprotons around in an accelerator until they reach nearly the speed of light, then whamming them together and examining the results. 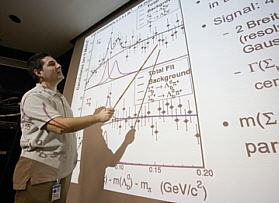 Johns Hopkins assistant professor Petar Maksimovic presents the discovery of two new subatomic particles to the particle physics community at Fermilab. Photo courtesy Fermilab Late last year, a team of scientists that included four Johns Hopkins physicists sifted a hundred trillion of these collisions and discovered something extremely rare-two new subatomic particles. The particles, represented as Σb and called Sigma-sub-b, are each made of three quarks, the basic constituents of matter, and decay in a fraction of an instant. Particle physicists had theorized their existence. Now they have been spotted in the wild, so to speak. One oversimplified but useful way to think of the composition of matter is this: Quarks combine to form baryons, and baryons combine to make everything else. The most common baryons are the protons and neutrons that form the nuclei of atoms. The new Sigma-sub-b particles are baryons, too, the heaviest yet found, unstable and so short-lived as to barely exist at all. Hopkins assistant professor Petar Maksimovic, from the Krieger School's Department of Physics and Astronomy, presented the news of the discovery. He led a team of nine that included Hopkins post-doc Matthew Martin, graduate student Jennifer Pursley, and former undergraduate Michael Schmidt. They combed through data accumulated during five years of high-speed particle collisions created by the Tevatron, a collider that's part of the Fermi National Accelerator Laboratory in Illinois. Their hunt turned up 240 Sigma-sub-b particles. Quarks come in six varieties. Physicists had to call them something simple and memorable, so they named them up, down, strange, charm, top, and bottom. One of the new Sigma-sub-b particles is positively charged and composed of two ups and one bottom; the other is negatively charged and made from two downs and a bottom. Bottom quarks are extremely hard to produce, which is why physicists use the Tevatron. It creates billions of collisions per second, some of which result in fleeting glimpses of bottom quarks. Johns Hopkins athletes did exceptionally well with their feet this past fall. Men's soccer advanced to the quarterfinals of the NCAA national championships before losing to Messiah, 2-1. The women's soccer team made it to the second round of the NCAA tournament before falling to Virginia Wesleyan. And though Blue Jays football endured a disappointing season, kicker Ben Scott, a senior, became only the second Hopkins football player ever to be named an All-American. Senior kicker Ben Scott finished third in the nation for punting and kicking. Men's soccer won more games than any team in the program's history, compiling a sterling 19-2-2 record in a season that included a 12-game winning streak and a ranking of 7th in the national intercollegiate soccer polls. In the course of the season, senior goalie Danny Coble shut out 14 opponents, becoming only the second Hopkins men's soccer player ever to be named first-team All-America. Junior Ben McAbee was named second-team All-America. The women's soccer team ended its schedule with a record of 18-2-1 and its second straight Centennial Conference title. The Jays rose as high as 8th in the national rankings before ending their year at 18th. 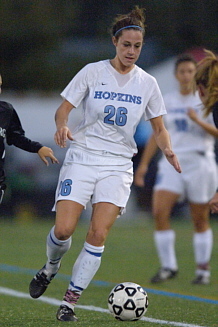 Senior Kaitlin Giannetti became the first Hopkins women's soccer player ever named first-team All-America. She scored five game-winning goals in her final season. Richard Macksey was just 13 years old when he started collecting books. With a $5 bill in his pocket-birthday money, he says-he took the trolley from his home in Montclair, New Jersey, to a used bookstore in nearby Newark. The book that caught his eye was Henry James' Roderick Hudson. Macksey started collecting books when he was 13 years old. A half-century later his collection fills his home. Photo by Will Kirk The novel cost $6-too expensive for his budget. So he skipped lunch and talked to the shop owner about lowering the price. "He took pity on me," says Macksey, A&S '54, '57 (PhD). "He told me, 'I'll take $5 and throw in the tax.' I think he gave me a quarter for my car fare and threw in a bag of peanuts to make up for the lunch I missed." Looking back more than a half-century later, Macksey is still pleased with the book that started his collection, which has since grown to include more than 70,000 books worth roughly $4 million. "That's a good novel and not a bad place to start," he says. Macksey, who has been on the Johns Hopkins faculty since 1958 as a professor in the Writing Seminars and later in the Department of History of Science and Technology, co-founded the university's Humanities Center. He has long taught his famed graduate-level seminars in his home library. 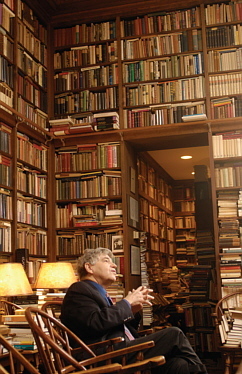 His books — which cover topics ranging from French literature, film studies, and philosophers (American and Continental) to cookbooks and oenology (from 1600 to the present) and extend 13 shelves high and two and three volumes deep — have served as more than just a backdrop. They are read. They are quoted. They are studied. They are loved. Now that Macksey has announced his intention to bequeath his collection to the Sheridan Libraries, Hopkins students and faculty will use the books from his library for years to come. "I've been here so many years," Macksey says, explaining the decision. "Hopkins is family." The books in his North Baltimore home aren't just confined to the library shelves. They're stacked on the windowsills and piled on floors and tabletops. They're located on all four floors and in nearly every room, including the garage. Asked how the books are arranged, he quips, "It's archaeological. The oldest books are in the back of the shelves with the new books stacked in front of them." Macksey, who speaks and writes in six languages, has many interests, and his book collection reflects that. There's a Babylonian cuneiform tablet, French literary and philosophic books of the 16th and 17th centuries, and first editions of books in English, French, German, Italian, Spanish, and Russian. He pulls out a leather-bound book from a shelf and opens it. It's a 1492 Anton Koberger edition of Virgil, the text framed by commentaries from Renaissance scholars. "It's a beautiful book," he says. "But I don't have a lot of the beautiful things they have at the Walters [Art Museum]. Some people go for bindings. I'm interested in the text." Many of the volumes now worth quite a bit — some of Herman Melville's, for example — he purchased years back when they were not so dear. Association copies, books that passed through an author's hands, are of special interest to Macksey. "A lot of my books are in tacky condition," he says. "They're association copies. I'm interested in who had the book, in who used the book. A perfectly dreadful looking text may turn out to be immensely interesting." As an example, he pulls a worn copy of W. B. Yeats' The Wind Among the Reeds from a shelf and opens it to read an inscription from the poet to an actress. "To Mrs. Patrick Campbell, whose perfection in The Wives had the simplicity, sincerity, and austerity which the author of this book has strived for too often in vain." "It's a beaten-up copy, but a lovely inscription," Macksey says. John Buchtel, curator of rare books for the Sheridan Libraries, lauded the collector's good eye and excellent taste. "There is a sense that if Dr. Macksey collected it, it's worth collecting," he says. "He has been collecting for a long, long time in some areas where we don't have complete collections," Buchtel adds. "We do have a lot of Maryland and Hopkins authors, but because of Dr. Macksey's love for Hopkins, he's really collected interesting aspects of Hopkins' intellectual history. He was there for a lot of it. For example, he was at Hopkins when Jacques Derrida brought deconstructionist literary theory to America, and he has a good collection of Derrida. It will be wonderful to be able to add those things to our collections and make them available to our students and faculty." In early December, the Johns Hopkins community received the sad news that Nancy Forgione, a visiting art history professor, had died of a meningococcal infection. In a letter to faculty, students, and staff, Krieger School Dean Adam Falk explained that Forgione had been feeling ill for several days before being hospitalized on the morning of Saturday, December 2. Her condition deteriorated quickly, and she died the next day. 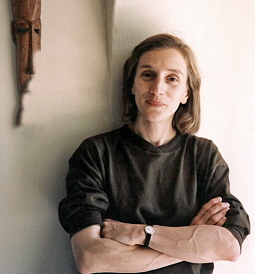 Visiting professor Nancy Forgione Forgione, 54, earned both her undergraduate degree in humanistic studies (A&S '74) and her doctorate in art history ('93) at Hopkins. She also held a master's degree in library science from the University of Maryland. She wrote her dissertation on the work of French artist Edouard Vuillard and taught undergraduate courses at Hopkins in 19th-century art and Abstract Expressionism.